The DigitalFlow GS868 and XGS868 Ultrasonic Steam Flowmeters solve the problems of pressure drop and rangeability found in other flowmeters, reducing operation, installation and maintenance costs. The DigitalFlow GS868 and XGS868 Ultrasonic Steam Flowmeters solve the problems of pressure drop and rangeability found in other flowmeters, reducing operation, installation and maintenance costs. 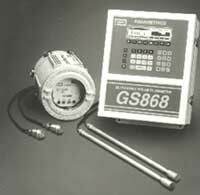 The GS868 is a full featured flowmeter while the XGS868 is a lower cost flow transmitter. Using Correlation Transit-Time technology, the meters are obstructionless, causing no pressure drop, so full steam power is always delivered. They measure mass flow rate of saturated and superheated steam over a very wide range. When measuring steam flow rate, pressure drop caused by flowmeters such as orifice plates and vortex shedding, robs energy from the steam, reducing the amount of power and heat delivered to the user. Using two ultrasonic transducers that do not protrude into the flow stream, the GS868 and XGS868 are obstructionless, causing no pressure drop and reducing steam generation costs. There is no regular maintenance required with the new flowmeters, further reducing long term cost of ownership. Their titanium transducers have an all metal boundary and are not affected by erosion from droplets. They will not fail due to thermal expansion cycles. A single GS868 or XGS868 ultrasonic flowmeter can cover a wide range of flows, giving additional savings. Because of their limited turn down ratios, conventional meters are used in multiple runs to cover all steam flow rates during high and low demand periods. Using a single one of these flowmeters to cover the full range results in lower capital and installation costs. The two flowmeters can be used with wet, saturated or superheated steam. Turn down ratio is 150:1. Maximum temperature is 205°C with regular company transducers. Higher temperatures, up to 500°C, are possible with the company's Bundle Waveguide Technology system transducers. Pipe sizes can range from 2 to 48 inches. Pressures can range from 0 to 3200 psi. Panametrics, Inc., PCI Division, 221 Crescent St., Waltham, MA 02453-3497. Tel: 781-899-2746 or 800-833-9438. Fax: 781-894-8582.